Here's the major events story. 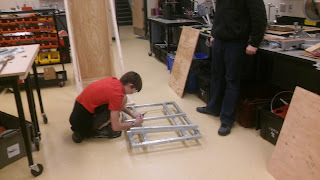 Work started on the new robot. Members of the team started measuring the base for bumper sizes. There was talk about how the bumpers were going to be made this year, and how the fabric would be sewn. Searching the web, Chief Delphi, and more, we came across an interesting way to sew the red and blue fabric. A flap in the middle, that can flip to either alliance color before a match. Pool noodles were cut (That was fun) and wood was screwed together for a template. That's all that happened with bumpers. Skip ahead a few days and out comes this beautiful thing. Wonderfully water jetted by IV pieces, put together with lots of bolts. Surprisingly, when we thought this would be our practice frame, It is actually going to be our REAL frame. Not a total surprise, considering we only have about a week or so left of build season, before bag and tag gets here. > It flies over rough terrain! Yes, literally. But that was without much weight, and full powered CIMs. > Chains are annoyingly painful to put on. > 3 CIM shifting gearboxes, to allow the climber system to deploy. > Black pneumatic wheels. Stylish! > Short enough to go under the low bar. 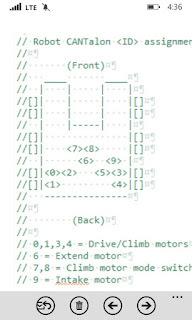 As seen in the picture above, The intake has been put on to the robot. 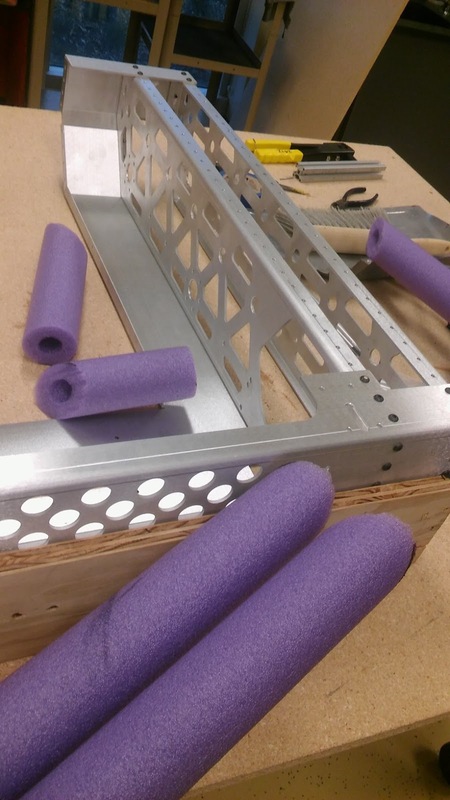 Some parts have been 3D printed, while others are waiting to be machined at IV. The 3D printer was nice to us today. > Rollers set in the back of the system (3D Printed) to keep the boulder from flying out. > Intake built to also roll/shoot ball out of system, into a low goal. > 3D printed parts soon! Members of the team worked long and hard to put this cart together. It got significant progress done over this week. Then it was modified with metal standoffs and wood boards to be a cart shape. This cart has 2 Omni-directional wheels in the back for mobility, and 2 regular rubber wheels in the front. 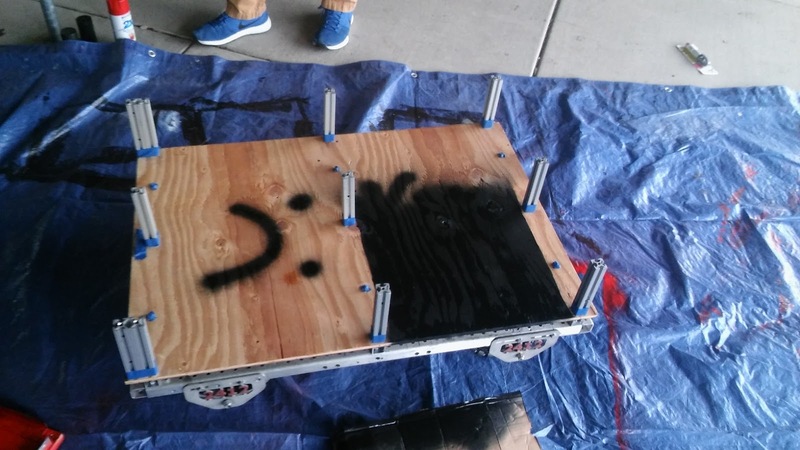 When the shape of the cart was finished, some members took it outside to spray paint it the powerful school colors this team prides with. 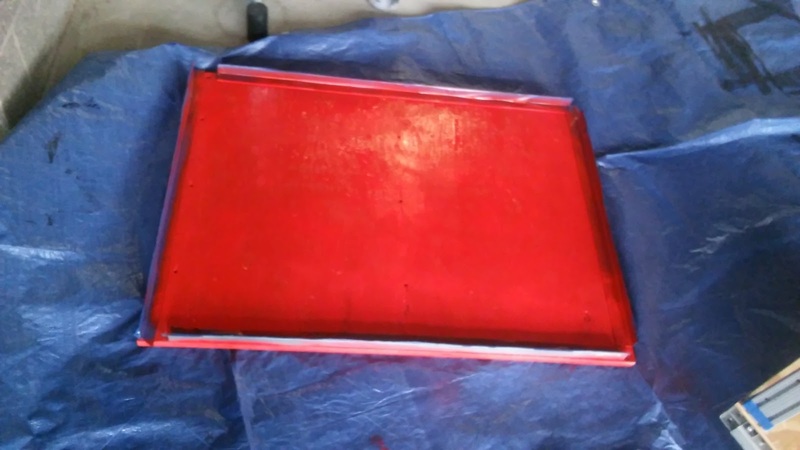 It was decided by the cart lead and another member that our mascot RT would be painted on this top red part of the cart to show our spirit for this team. The electronics board came too! Freshly done at IV. We attached 12 Talon SRX's to it, and wired those to the power distribution unit. This board is designed to slide in and out of the drive base if we need to access it. We ran into some problems with the RoboRio causing it to be to wide and unable to fit in. That is being worked on. Unfortunately there are no pictures of it yet. It looks pretty nice though. 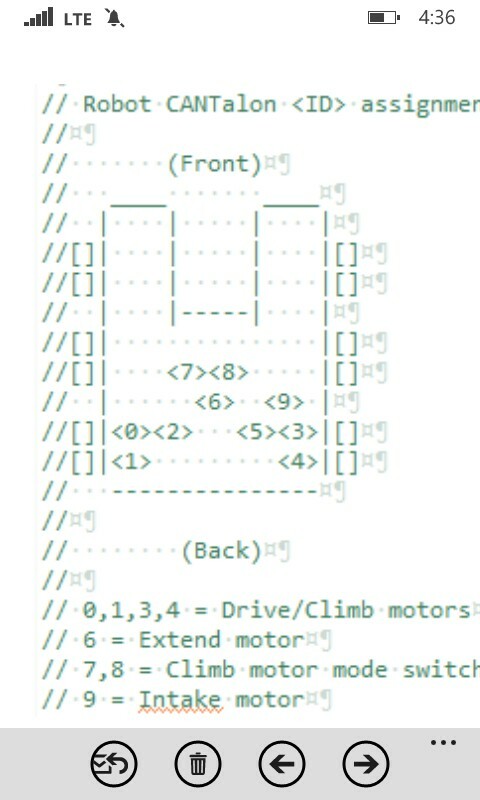 Our programming team has been working on and off with robot code. Website work is also being done, and plenty of research has happened. Who knows what goes on behind those screens. 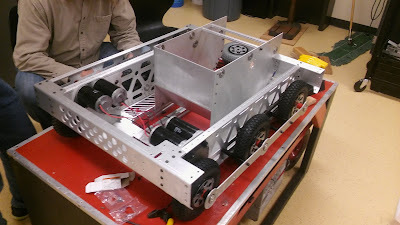 We hope to get the robot driving soon, as software has been prepped, and is waiting for the actual bot to be finished. All seems well and will go on.